The team from Design Interiors have been working hard over the last month as our hotel renovation project continues. We’re hugely excited to have been given this opportunity which will be the largest single commercial renovation project ever taken by Design Interiors. For those of you who haven’t read our previous blog on this hotel, you can find it here. This old hotel is being converted in to 50 luxury apartments, which means we’ve had to fit 50 new kitchens from scratch in areas that were not originally intended for use as kitchen space. 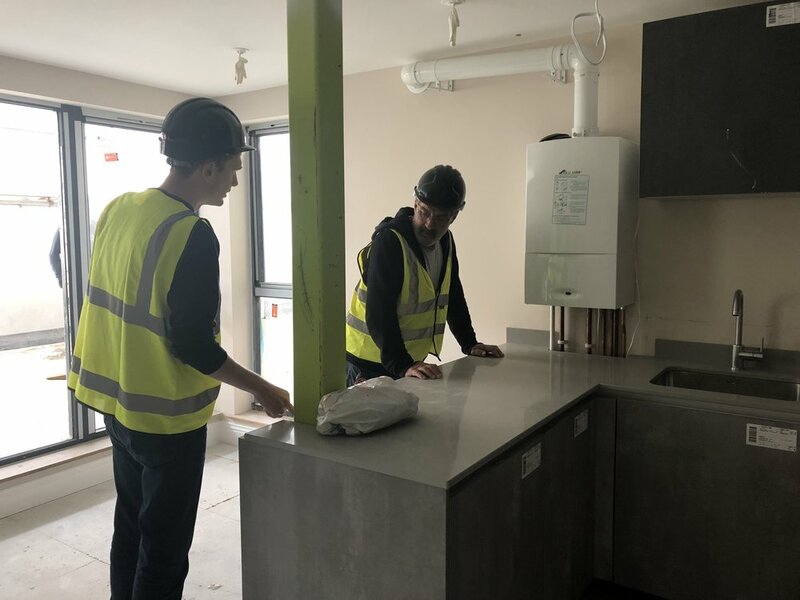 We’re never ones to shy away from a challenge, and since we first began work a month ago, many of the kitchens are coming towards completion with worktops fitted by our friends at LBS Stone and cupboards all fitted by Design Interiors. Much of the work on the fourth and fifth floors is close to completion, with the penthouses likely to be the first apartments to be finished. Our talented designer Tim is the senior designer and project manager for this job, and you can see him on the left of the first picture alongside managing director Michael Rogers. Please see our showcase page to see some of Tim’s fantastic design work. We know that the renovation of this old hotel is of great interest to many of the people in Brighton and Hove who were sad to see an old building with such potential being left to decay. With an expected completion time of spring 2019, Design Interiors are already looking forward to completing our task of giving this old building a new lease of life. We’ll keep you updated as this fantastic project continues.